I have been challenged by my teammates to kick-start my Leukemia & lymphoma society (LLS) 2010 fundraising. The challenge is this: to ask 100 friends to donate at least $10 to LLS in the next 100 hours. The time starts right now at 8:30a.m. September 22, 2010 and will end on September 26, 2010 at 12:30p.m. At the end of the week, we will find out who has the best friends. I’ve been talking you all up… so please help. Skip that latte tomorrow morning and donate to find a cure for blood cancers. Or skip it for a week and donate more. I am at the 50% mark and need to raise another $1700 by October 3, 2010 to reach my goal of $3200. Can you help? If you can donate and then forward this on to your friends that would be great, because the more people that donate, the quicker I can reach my goal. Please use the link in this email to donate online quickly and securely. Donations are 100% tax deductible. I am raising money for the Leukemia and Lymphoma Society by participating in Team in Training. I am training with the team to run the Nike Women’s Marathon in San Francisco, CA, on October 17, 2010. Team in Training has raised nearly $1 Billion dollars to fund research, patient services, and education but we still don’t have a cure for blood cancers. Every donation counts in our fight against cancer. 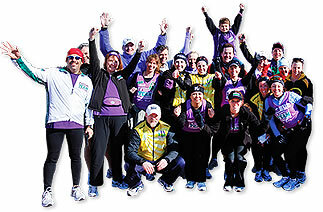 Each donation you make helps accelerate finding a cure for leukemia, lymphoma and myeloma. More than 823,000 Americans are battling these blood cancers. I am hoping that my participation in Team in Training will help bring them hope and support. On behalf of The Leukemia & Lymphoma Society, thank you very much for your support. I appreciate your generosity. I will keep you updated on the progress of this challenge. Thank you in advance for your help and for forwarding this on to your friends!